Keynote speaker Ellyn Spragins talks to the Spring 2016 class of the Professional Leadership Program for Women in the Minnegan Room at Unitas Stadium. Tuesday was the kickoff event for the program’s second year. 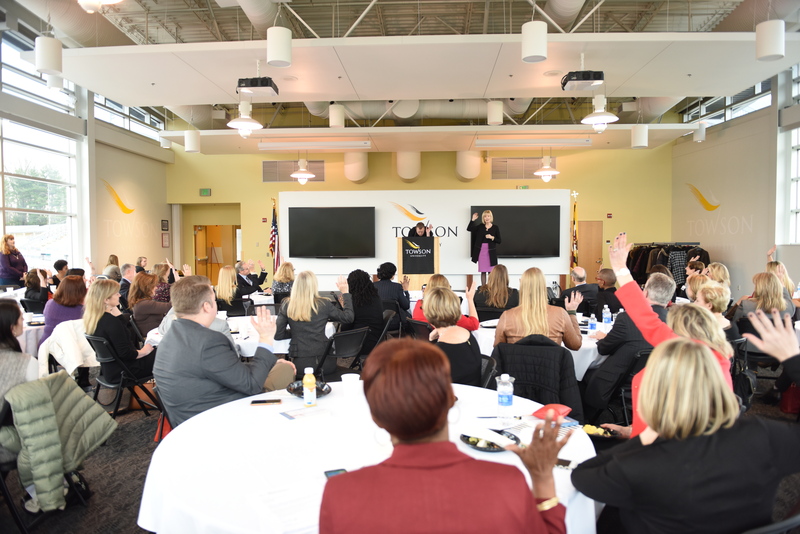 One of the keys to Towson University’s growth is its commitment to providing leadership development opportunities to the Greater Baltimore community. TU is providing unique leadership skill-building to some of the finest female leaders in central Maryland with the kickoff of the second annual Towson University Professional Leadership Program for Women on Tuesday morning at the Minnegan Room inside Johnny Unitas Stadium®. Designed by business, community and educational leaders, the program provides hands-on, practical learning and coaching in a supportive environment and continues to push TU into the forefront of leadership development. This year, the program welcomes 21 diverse and accomplished group of women leaders from a broad range of professions. Tuesday’s opening session featured keynote speaker Ellyn Spragins, New York Times best-selling author of the “What I Know Now” series of books. Afterwards the women started their first session of the program. Learn more about Tuesday’s opening session or keep up with the program on Facebook.